What Should I Do If My Hearing Aid Gets Wet? A wet hearing aid may still be serviceable if you take certain precautions. 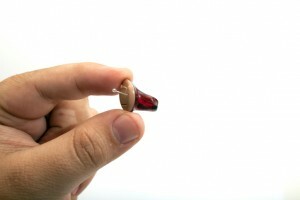 Many modern hearing aid devices on the market are moisture-proof. That means they won’t get damaged from walking outdoors on a rainy day. Still, most hearing aids are not completely waterproof, so it’s important to be conscious of wet environments. If you accidentally jumped into the pool with them on or dropped them in your wash basket, they could become seriously damaged. Here are few tips if your hearing aid gets wet. Rinse the hearing aid thoroughly with clean water if it was submerged in dirty or salty water (the ocean). Place the hearing aids on a dry newspaper to air-dry for at least 24 hours. You can use a table lamp to speed up the drying process, but do not place it too close to the light bulb or heat source. Alternatively, take a cup of uncooked rice or silica gel and place it together with your hearing aid in a plastic bag or container. Seal the container and leave it overnight to dry. You can also use a fan, hairdryer (only use the lowest setting), or a dehumidifier to help dry out your hearing aid device. Keep in mind that you should never expose your hearing aid to high heat. Heat can cause even more damage to your hearing aid device than water. If you’ve gone through these steps and your hearing aid is still not functioning, take it to your hearing aid provider to determine whether or not it can be repaired. Don’t panic! Your hearing aids might not be completely beyond fixing. Need help with your hearing? Clarity Hearing can help. Clarity Audiology & Hearing Solutions is an independently-owned and operated clinic that focuses on quality of care and personalized, friendly service. Our Doctors of Audiology are highly trained with advanced degrees and take the time to provide the personalized care and attention that you need and deserve. We provide advanced hearing aid options that personally calibrated with cutting-edge digital technology to fit your hearing loss, your unique ear anatomy, and your individual listening needs. This entry was posted on Friday, November 18th, 2016 at 2:21 pm. Both comments and pings are currently closed.